eleven shots taken over eight months. Eight thousand light years from the Earth, in the constellation Sagittarius, lurks a massive binary-star system that is on the verge of becoming a supernova. The star is call Wolf-Rayet 104 and, like Sagittarius the archer, this star could be taking aim at us. If it finds its mark, it could hit us with enough deadly radiation to destroy our protective ozone layer. This would cause drastic climate change that could trigger a mass extinction. 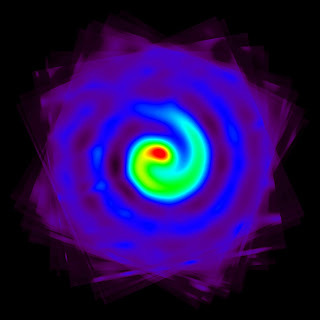 Wolf-Rayet stars, named after the two astronomers who discovered them first, are massive, hot, and very luminous. They are about 25 times more massive than our Sun, and 100,000 times more luminous. Super massive stars like WR-104 live fast and burn their nuclear fuel very quickly, within tens of millions of years. Compare that to the age of our Sun which is 4.6 billion years. As they exhaust their supply of nuclear fuel, they undergo gravitational collapse into a black hole, releasing a massive blast of high-energy radiation—a gamma ray burst so powerful that it would briefly outshine an entire galaxy. Gamma rays are the deadliest, most energetic type of radiation. Energy from the explosion is beamed into two narrow, oppositely directed jets. Because WR-104 is a binary star system it produces a spiral-patterned stream of dust and charged particles as the stars orbit each other. As the star collapses, it becomes a dense, flattened, rapidly-rotating disc and the gamma rays are ejected along the rotational axis poles, rushing out like soda from a pop can that had been shaken before opening. If the poles of the collapsing star happen to be pointed at us—look out. And because astronomers can see the spiral of this star full on it means that the star’s rotational axis is pointed in our general direction, as if Sagittarius’s arrow were pointed right at us. But don’t worry too much, the time line for such an event is anytime in the next 100,000 years. Also, recent evidence suggests that it is pointing slightly away from us and will miss its mark.